Jennifer Silverberg Pork out: A one-pound pork porterhouse served over kale, topped with apple compote. 354 North Boyle Avenue; 314-531-4607. Hours: 11 a.m.-11 p.m. daily. This week marks the beginning of my third year reviewing restaurants for Riverfront Times, and as I look back over the past twelve months, I can't help but conclude that these are strange times for the city's dining scene. There is reason to celebrate. Food & Wine magazine named Gerard Craft of Niche one of its "Best New Chefs" for 2008, and Niche itself, with Steve Ciapciak recently installed as chef de cuisine, is better than ever. Craft, Ciapciak and other talented young chefs such as Josh Galliano of An American Place and Kevin Willmann of Erato have established a new standard for cuisine in St. Louis: innovative without sacrificing proper technique or the simple pleasures of a great ingredient well prepared and — crucially, as the world's food economy continues to collapse under its own weight — looking to local, sustainable growers whenever possible. None of the restaurants that I've visited since August of last year have met the challenge set by these chefs. That's not so surprising. The challenge is steep, after all. What strikes me, though, is how none of these restaurants have really even tried to meet this challenge. The best stepped polished and gleaming onto the stage, offering this or that twist to what we already know well. Most skipped the twist. Is this just the coincidence of the calendar? Or has the economy and the shutdown of 40 led restaurateurs to settle for the comfort of the familiar? Does St. Louis have room for only so many elite restaurants at any one time? I doubt we will learn the answer soon, if ever. That said, a positive trend that began long before this year has continued. Call it the bottom-up approach: small restaurants — neighborhood joints, more often than not — that in their dedication to quality are raising the bar on everything from pizza parlors to gastropubs. Think of Iron Barley, Stellina Pasta Café and, more recently, the gastropubs Newstead Tower Public House and the Shaved Duck and the pizzerias Katie's Pizzeria Café, Pi and Onesto. West End Grill & Pub fits this broad group. If it doesn't quite reach the level of the places I just mentioned, that's mostly because the menu takes on especially tricky territory: the neighborhood bar and grill. The neighborhood in question is the eastern edge of the Central West End, not far from the old Gaslight Square. The restaurant occupies an attractive space next to the Gaslight Theater. You enter into the bar, which doubles as the smoking section. The dining room features lots of wood and a warm, dark-red color scheme. Framed copies of Playbill and other theater memorabilia decorate the walls. At first glance the menu is unremarkable. At the very least, appetizers like olive fritters, polenta fries and a pulled-pork empanada seem more interesting than an entrée board with steak, chicken, pork, trout, salmon and crab cakes. But chef Alan McReynolds comes to the West End from the late Red Moon, and he adds enough flourishes to distinguish much of the fare. Case in point: On my first visit, I ordered salmon. This is rarely my first choice among entrées. Few local restaurants bother to get the really good stuff. (Given the cost of king salmon lately, I can't blame them.) What they do get, they usually overcook. West End's menu makes no claim as to its salmon's provenance, but the preparation caught my eye: The fish is encrusted with Szechuan peppercorns and coriander seeds and served over Brussels sprouts lightly accented with lemon and a turnip mash. Though our server didn't ask for my preference, the salmon was cooked to medium, approximately, and the tender interior was an ideal foil to the exterior's crisp crunch. I didn't experience the tingling sensation that is the hallmark of the Szechuan peppercorn (so called for its resemblance to true peppercorns; the two have no relation), but I enjoyed the citric, slightly bitter edge the coriander provided. In general, I liked the seafood at West End. Ruby-red trout, sautéed with the skin on, benefited from nothing more than a dollop of tarragon crème frâiche and a relish of poblano chiles and corn, while a shrimp appetizer bulked up the bland little critters with Serrano ham, chopped mango and a verdant cilantro pesto. The crab-cake entrée, two fat cakes atop a roasted red-pepper coulis, wasn't especially flavorful, but the coulis and the surprisingly peppery slaw on the side helped. 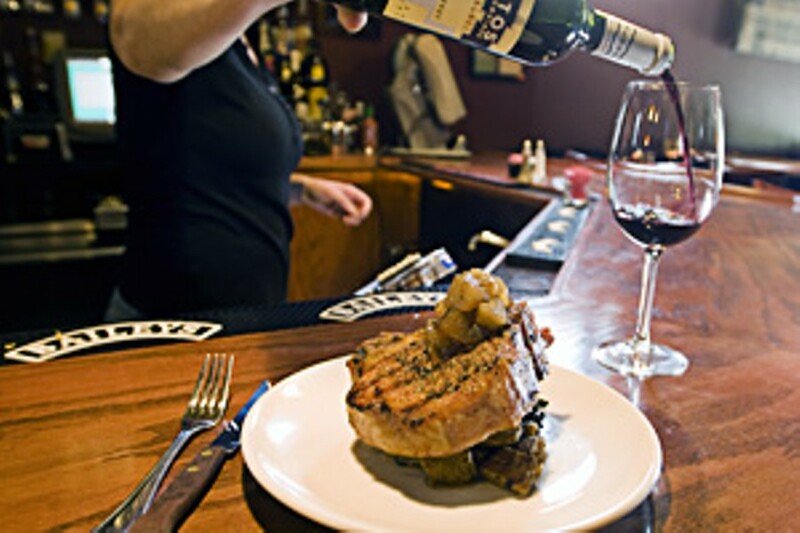 The menu's steak option is the shoulder cut known as Sonoma, served with fried leeks and blue cheese. I opted for the daily special, a tenderloin in red-wine sauce with a crab and blue-cheese risotto and grilled asparagus. The steak was excellent, the flavor straightforward, but the risotto had a gluey texture, the result of too much cheese or not enough broth. Pork steak fans might consider the pork porterhouse, which brings you a full pound of pig. The presentation is a small twist on a classic pairing, with an apple compote on top of the steak and kale braised in cider vinegar beneath it. This was more pork than even I could finish. Also, the combination of flavors wasn't interesting enough to carry a dish this big. The kale's astringent note was especially tiring. The menu includes salads and sandwiches. Of these, I sampled only the hamburger, with cheddar cheese. Here the West End didn't try to improve upon the basic bar-and-grill template: This was a classic American hamburger — nothing more, nothing less — and quite good. Among the appetizers, the pulled-pork empanadas were notable for the very tender pork (so tender that I think it spoiled me for the not-as-tender pork porterhouse) and a smoky, tangy chioptle barbecue sauce. The polenta fries were sort of the Platonic ideal of the fried appetizer: crisp but not burnt outside, scalding hot and tender inside, with a mild flavor just distinctive enough to be enjoyed by itself, but perfect for dipping in Boursin cheese sauce. West End calls itself a pub, but with the exception of Smithwick's on draught, the beer selection isn't very publike. The wine selection is quite small. Service was generally good, though the staff seemed caught short when a weekday evening brought healthy walk-up business. 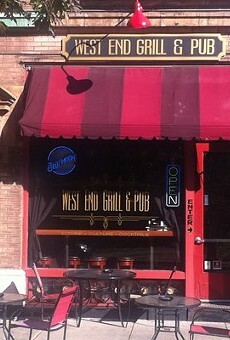 I'd expect the West End Grill & Pub will see much more walk-up business. Though only four months old, it feels like an established neighborhood spot, the sort of place you go on a whim. That it provides more than you might expect from such a restaurant is, in its own way, remarkable. Here's hoping that, this time next year, I can't say the same.